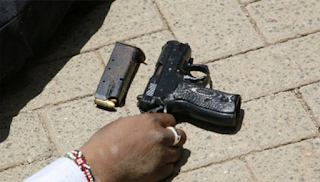 A notorious gangster popularly known as Obama was gunned down in Mowlem, Dandora area on Tuesday night by the CID officers in the area and a pistol recovered from him. The thug was in the company of a few others who went on a robert spree when police caught up with them. According to the Buruburu CID chief Henry Kiambati, others who were with him managed to escape but Obama was not so lucky this time. A barreta pistol with four bullets was recovered from him but the police said that the others who were also armed managed to escape with their guns. Kiambati said that Obama is a well known local thug who has been terrorising residents of Eastlands and police have been hunting him for the past six months.